The Daring Bakers’ challenge for November was technique driven. We caramelized sugar in two different ways to make a yummy cake and luscious caramel candies and we made a brown butter-based frosting that required caramelizing the natural sugars in butter. Although the challenge encompassed two recipes and sounds daunting, I was able to make both in the time it took the rest of the family to see Quantum of Solace (sorry Bond lovers, it’s just not my thing). 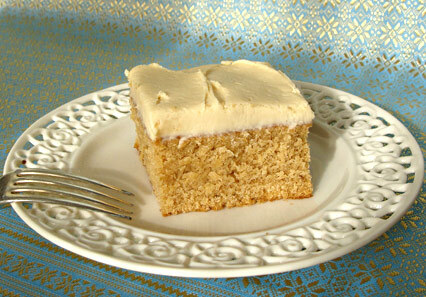 It was a fun and delicious challenge; in fact, the Caramel Cake with Caramelized Butter Frosting was eaten long before it had a chance to become stale. All the recipes worked well but if I were to make this dessert again, I’d bake the cake in a smaller pan so that I could cut the cake into two layers since there was more than ample frosting to cloak a layer cake. For the caramels, I made the recipe using ground vanilla beans (as directed) and garnished my finished candies with Cyprus flake salt and Salish smoked salt. The flake salt was a universal hit, while the smoked salt appealed to the adults exclusively. Truthfully, this Alice Medrich recipe is almost too good, making far more candy than my will power could endure. So, if I make these caramels again, it will be only just before a huge crowd comes over — I just couldn’t leave them alone! Hungry for more? 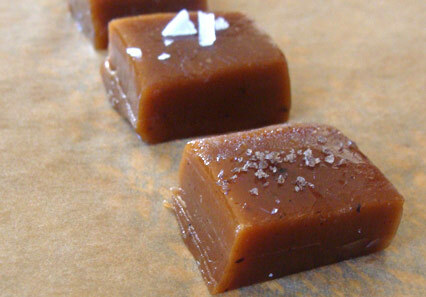 View more caramel capers by visiting the blogs published by other members of the Daring Bakers. Modern food packages are dotted with symbols that are supposed to help us make wise decisions at the grocery store. Fair Trade, Organic, Health Check, Peanut Free, Kosher, Halal, American Humane Certified and now… Jane Goodall’s Good For All symbol pop up on grocery shelves often. That’s right. 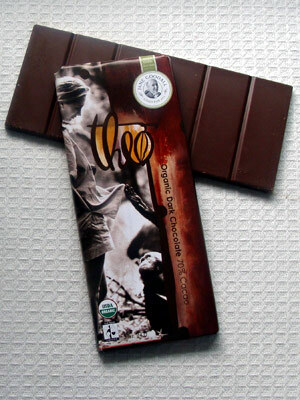 Jane Goodall, the chimpanzee expert, is endorsing foods like the Theo chocolate bars (pictured above). This chocolate has been approved by the Jane Goodall Institute because Theo works with farmers to grow cocoa in a profitable, ecological manner. A portion of the proceeds also go back to the Jane Goodall institute which aims to “ensure that people take informed and compassionate action to improve the environment for all living things.” Nice sentiments but will a Good for All icon persuade you to buy one good tasting chocolate over another? •	92% of consumers say they have a more positive image of a company that supports a cause they care about. •	87% of consumers say that, price and quality being equal, they would switch to a brand or retailer associated with a good cause. How do you feel about these icon programs? Do they affect your purchasing choices or just clutter up the consumer landscape, making it harder for you to figure out what’s actually in the packages on store shelves? As I’ve been traveling across Canada this week, I’ve had an opportunity to talk to a lot of Canadians and one prevailing theme has emerged: With the economy uncertain, everyone wants tips that will help them keep their grocery budgets in check. While cutting back can often feel like a hardship, presenting an impressive dinner party or Sunday roast is still possible. Although a prime rib roast can cost well over $10 per portion, pork roasts are much less pricey. 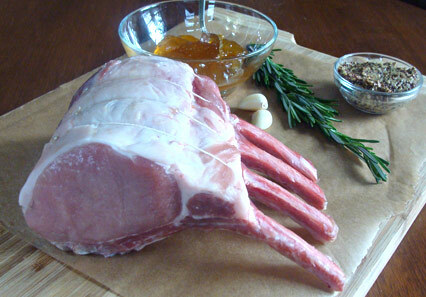 The four-bone rack of Canadian pork pictured above was only $8.65 (just over $2 per portion!) and I purchased it at a fancy gourmet grocer! I don’t know exactly what this roast would cost at a national chain or a more mainstream independent store, but I bet it would be less. I cook my pork roast until it registers between 155°F and 160°F when tested with an instant read thermometer. At that temperature the meat is still juicy, tender and a pleasant rosy pink colour. Do you have a favourite way to prepare roast pork? I’m going to be honest. When autumn arrived I was a bit let down. How was I going to cope without the great lettuce, tomatoes, cucumbers, beans and peas I grew in my garden? What would I do without my weekly trip to the farmers’ market for organic local produce? Could I go back to the grocery store? Then I remembered that Canada produces great squash and terrific onions. Eating local is still possible! The picture above features a bowl of my make-ahead prep for a tasty roasted veggie side dish that we’ve enjoyed several times this fall. It doesn’t have a name, but it tastes good just the same! •	Peel and chop up a butternut squash and chop up some fresh sage. •	Place a knob of butter on a rimmed baking sheet and heat the pan in the oven until smoking. •	Season with salt and pepper. 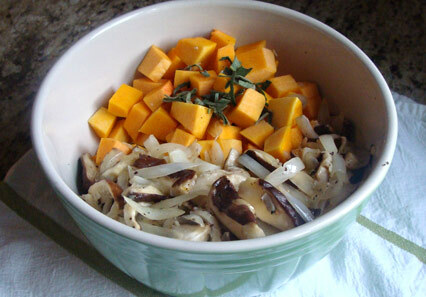 •	Roast for about 40 minutes or until the onions and squash are tender and caramelized. If the only thing stopping you from making a side dish like this one is that you hate peeling and chopping squash, you can buy the prepared stuff in the produce section; or, you can learn how to do it quickly, easily and less expensively by checking out the great step-by-step instructions post on the Simply Recipes blog. How are you coping now that autumn is giving way to winter? Are you eating fewer vegetables or finding great ways to enjoy what the store has to offer? Baking is my first love and, although I’ve been baking cakes, cookies and even bread successfully since I was a kid, double crust pies used to be my nemesis. The filling was often too runny; the bottom crust was sometimes soggy and my top crusts sometimes ballooned up during baking only to collapse when the pie was cut. Worst of all, the edges of my pies were rarely pretty unless I made a cardboard textured crust. All sad but true facts from my tortured past (like all artists, we bakers suffer!). Over the years I’ve worked on my pie-making techniques by practicing, reading and quizzing professional bakers. I’ve learned a lot of important lessons and now, about 95% of the time, I make damn fine pies. 1. Because I have warm hands, I use a food processor to make pie crust so that I handle the dough as little as possible. 2. If a pastry recipe says you can use all-purpose flour or cake and pastry flour, I use the all-purpose. It’s easier to roll and move than C&P based pastry. 3. I like to use a tapered rolling pin instead of one with handles. It’s easier to roll the dough to an even thickness. I also find my wrists get less fatigued when making a lot of pies if I use this type of rolling pin. I had a marble rolling pin which is prized for being cooler than wood but it was so heavy that it compressed the fat and flour so the resulting crust was not as flaky as it should be. 4. When making a big pie (over 9-inches/23 cm) in diametre, I like to roll the dough out on waxed paper so that it has support when being moved. In fact, I often roll the top portion of dough on waxed paper and then transfer it to the refrigerator to rest. Then I roll out the bottom crust, line the pie plate and place the lined plate in the refrigerator while I prepare the filling. 5. Although I’m still not the world’s best crimper, I’ve learned to roll out enough dough so that there is ample overhanging dough to make a pretty edge. 6. If using frozen fruit, thaw completely before using and drain off all liquid. If you want to use these juices, reduce them in a saucepan or thicken them with cornstarch before stirring them back into the filling mixture. 7. Cut lots of little vent holes in the top crust instead of several larger vent holes to prevent the crust from rising and forming air pockets as the pie bakes. 8. Always bake pies on the very lowest oven rack so that the bottom crust is exposed to the highest heat possible. (I’ve tried cooking pies on a preheated pizza stone and it works quite well, by the way). 9. 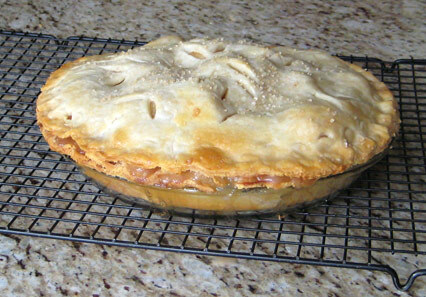 I always use a glass pie plate so that I can lift up my pie and check to see if the bottom crust is golden. If it isn’t, the pie bakes longer no matter what the recipe says. 10. Always bake fruit pies until the juices are bubbling. They don’t have to bubble over like my apple pie posted above but they must be boiling for the juices to thicken. Have you ever had a pie making disappointment? If not, what tips can you share that ensure your pastry prowess? Also: Happy Thanksgiving to my American readers! I hope you enjoy a wonderful meal with people you love to be with! Although I’ve never made cheese (I’d love to try it! ), I always keep a package of cheesecloth on hand. Besides using it to encase the flavouring ingredients that I want to remove easily from broths and infusions, I also use cheesecloth to line my strainer when I make homemade soup stock; it filters out all the little bits perfectly! Likewise, once the bulk of the liquid has passed through to a clean container, you can squeeze every drop out of the cheesecloth-wrapped solids and then toss the waste into the composter – so much easier than trying to clean all the little bits out of a chinoise! Amy Snider introduced me to one of the cleverest (and prettiest uses) I’ve seen for cheesecloth. Amy wraps a piece of cold butter in cheesecloth and ties it into a little beggar’s purse that she serves with hot corn on the cob. The idea is to rub the bundle over the corn so that every cob is swathed in a perfectly even coating of butter. Smart! 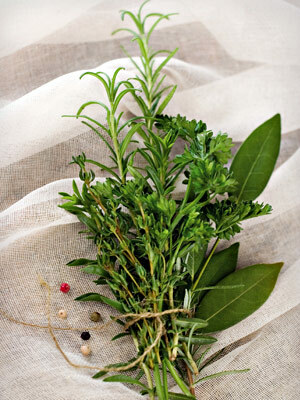 Do you keep cheesecloth in the kitchen? If so, do you have any innovative uses for it that you’d like to share? NB: I’m traveling a lot this week and will pop in and out to add updates from Ottawa, Halifax and St. John’s and to respond to comments when I can; however, I won’t be as present as usual. For continuity, I’ve pre-written some posts for the week so please do pop in daily. •	Info about Jane Goodall’s influence on the food business. I’m very happy to report that my blog Dana McCauley’s Food writer’s blog (http://danamccauley.wordpress.com) has been nominated for the semi finals in two categories of the Canadian Blog Awards. If enough people vote for my blog in this round, you may hear from me again, asking for your support as a finalist! Thanks for any support you can offer! Hmm… a video clip posted four Fridays in a row. I guess now that my gardening adventure is over, I’ve transitioned into couch potato mode. Care to join me? This video is purely a fun offering that blasts us back to my childhood. If only the TV chefs of today could be so lovable! Do you have a favourite Muppet’s Swedish Chef memory you’d like to share? Or, am I such a dinosaur that no one else reading here remembers the poor guy? You are currently browsing the Dana McCauley's food blog blog archives for November, 2008. Welcome to my blog! Have a look around, feel free to post some comments and tell me what you think. For my full profile, please see the About Dana page. Thanks for dropping by! I hope you enjoy your visit. Please subscribe to my blog and never miss a posting. Hungry for info on the latest food trends? Click here to read Dana's Topline Trends newsletter. Topline Trends Tuesday: Is less more? Except where otherwise noted, all text, images and video in Dana McCauley's Food Blog is licensed under a Creative Commons Attribution-Noncommercial 3.0 Unported License.